Duval handbags may be relatively new on the scene, but it’s a dream come true for designer Esther Hempel. Yesterday, I had the opportunity to meet Esther and hear how she designs and manufactures her collection of handbags by hand. Yes, that’s right – everything is hand-crafted by Esther: hand-punched and hand-sewn. These are gorgeous bags, made of the finest Canadian-sourced suedes and leathers. Esther’s care and attention to detail means that each bag takes about 14 hours for her to make. How did she begin her business? Duval handbags was launched in June 2016 and now includes a collection of eight handbags in styles including tote, cross-body, shoulder bag, wristlet and clutch. Esther also believes in giving back. “If we all do a little bit, we can make the world a better place,” she says. Esther donates 10% of her profits to the charity, A Better World Canada, which is currently supplying textbooks to Kenya. Please visit her website, www.duvalcanada.com for more information and to purchase her well-crafted bags. Another Edmonton fashion success story! Many women wonder how to stay cool and stylish during hot summer months. There are some great options that don’t involve oversized Ts and cargo shorts. Try these looks for afternoons at the Farmer’s Market, a family backyard bbq or strolling City streets window shopping. This cute sundress is perfect for sunny afternoons on the patio (yours or a local pub). 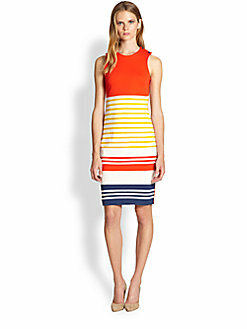 The bright colours are perfect for summer and it’s fashionably easy to wear. It’s also suitable for office if paired with a blazer (which will also help keep cold A/C off your neck and shoulders). Many women like to wear shorts, especially outside of work. The French believe that no one over the age of 12 should be caught dead in shorts, especially women. 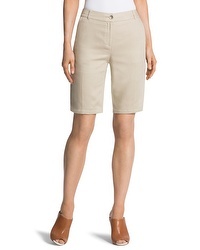 If you do like to wear shorts, be sure to choose those with natural fabrics, such as these great linen shorts. Please do not wear cargo shorts or athletic wear! Neither is flattering nor suitable for daytime events. To be chic and stylish, never wear shorts with athletic shoes, sun visors or fanny packs. Instead, pair shorts with a light tank top or blouse. Don’t forget to accessorize with a chunky necklace and sleek sunnies. 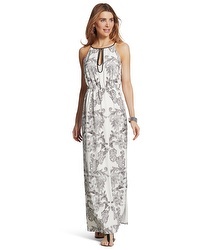 The other look I like for summer is a cool maxi dress. Many people might think that maxi dresses are too warm, but they are surprisingly light and flow-y. Again, choose natural fabrics that breathe and move with you. There are many great looks – find your own style and have a chic summer!